IN STOCK & GRILL READY! : Jake's Famous Tri Tip, Steak, and Rib Dry Rub for Sale Special. Jake's Famous Dry Rub for Sale and Tri Tip Steak and Rib Dry Rub are multi-award winning steak rub, tri-tip rub and rib dry rub and is the culmination of 2 years of planning and development. We set out to create a steak rub that captured the flavor of the well know Santa Maria region famous for Tri Tip. We ended up creating an amazingly flavorful Tri Tip, Steak and Rib Rub seasoning. 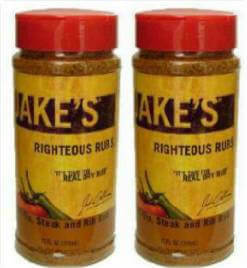 This is the 1st in our series of Dry Rubs for Sale. Our goal was to produce a premium marinating rub designed to deliver true Western region flavors that are deeper and richer in taste. As we've said over and over the cornerstone of every great BBQ starts with your bbq rub. Spices are meant to enhance not overpower the flavor of whatever you are cooking and also to pair with whatever basting sauce you use. Our Tri Tip, Steak and Dry Rub for sale produces a delicious crust built on a base of selected coarse ground black pepper, garlic, onion, paprika, brown sugar to deliver a slight sweetness while giving the meat a golden brownish color. Smoked hickory salt, oregano, tarragon and more are added to complement and enhance the marination process. Tri-Tip, Steak and BBQ Rub for Ribs: BBQ Ribs, Tri-Tip, Buffalo Ribs, Pork Baby Back Ribs, Steaks, Beef ribs, Chicken and more. Give yourself the BBQ Rub for Ribs seasonings you deserve now with this special combination. Available in clear containers with additional sifter that measures 2.5" diam. x 6" high. Larger sizes are available.